This time last week, I was privileged to see the late Phineas T. Barnum discoursing on his celebrated Feejee Mermaid (as pictured on the left), in the small North Devon village of Woolfardisworthy. This isn't as unlikely as it sounds, since Woolfardisworthy is the home of the Centre for Fortean Zoology, which last weekend hosted their annual gathering: the Weird Weekend 2011. In true Barnum tradition, neither the mermaid on display or Barnum himself were exactly authentic. The latter was played by Silas Hawkins, while the mermaid was a model made for the CFZ by special effects wizard Alan Friswell. 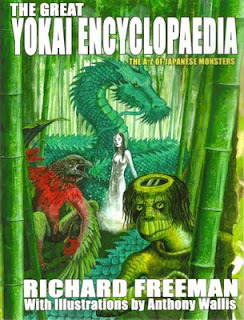 The original "Feejee mermaid" was displayed by Barnum in the nineteenth century, and should more correctly be described as a Ningyo -- a legendary Japanese creature that is smaller and uglier than the traditional European mermaid. At one time it was not uncommon for Japanese sailors to fake Ningyo specimens by stitching the top half of a dead monkey onto the bottom half of a dead fish. 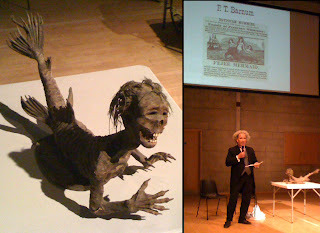 The first mermaid exhibited by Barnum was one of these... a genuine fake, in other words. However, after the original was destroyed in a fire, he resorted to displaying a fake fake! The CFZ model is also a "fake fake", by the way -- no dead animals were involved in its construction! The Ningyo is an example of a Yokai -- a generic term referring to a wide range of monsters, demons, ghosts and other creatures from Japanese legend and folklore. 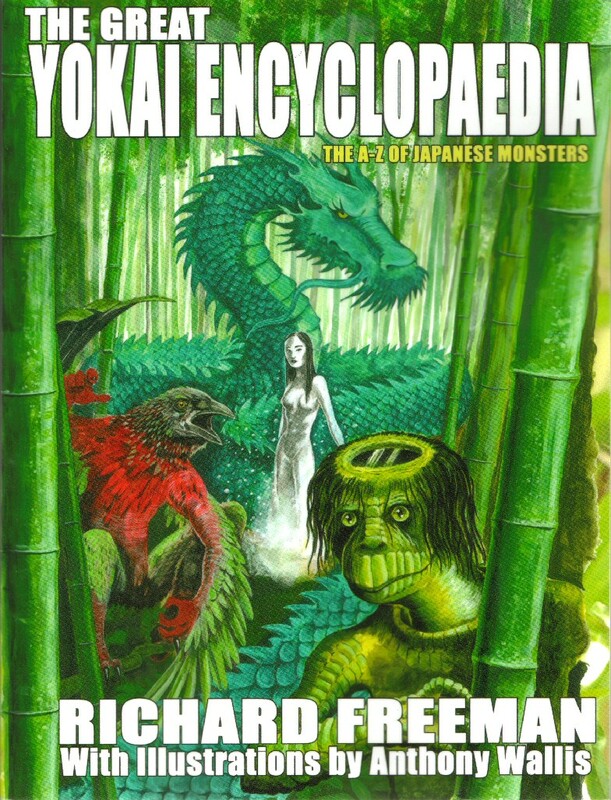 The most comprehensive reference work on Yokai in the English language is Richard Freeman's 400-page Great Yokai Encyclopaedia , which was published by CFZ Press last year. My copy (pictured right) was secured at the Weird Weekend for just 12 pounds -- 20 percent off the list price. As if that wasn't enough of a bargain, Richard was then good enough to sign it for me... no doubt doubling its value!